2012. 2. 10. 법률 제11298호로 제정·공포되어 2013. 7. 1.부터 시행된 난민법은 출입국항에서의 난민신청제도가 도입되고, 난민신청자의 절차적 권리에 관한 규정이 보강되었으며, 난민지원시설의 설치·운영에 관한 근거가 마련되는 등 대체로 난민의 권리가 향상되는 데 한 걸음 더 나아갔다는 평가를 받고 있다. 난민법은 제6조에서 출입국항에서의 난민인정신청을 명문화하고 있는데, 동 조 및 시행령은 시행 초기부터 논란의 중심에 서 있다. 출입국항에서 난민인정신청을 하였다가 법무부장관의 불회부 결정을 통보받은 신청자가 있다면, 그에게 행정소송 등 불복절차를 인정할 것인지, 이러한 절차를 인정한다면 신청자는 불회부 결정을 다투어야 하는지, 입국거부처분을 다투어야 하는지는 명확하지 않다. 또한 동 규정들은 이러한 절차를 거치는 동안 신청자가 어느 곳에 머무를 수 있는지, 그리고 변호사의 조력을 받는 등 절차적 권리를 보장받을 수 있는지에 대해서도 침묵하고 있다. 무엇보다도 이러한 논의는 우리나라가 당사국인 난민협약 및 난민의정서 등 국제인권법의 관점에서도 고찰이 필요하다. 한편, 난민법 제18조는 구 출입국관리법과는 약간 표현을 달리하여 요건을 갖춘 난민인정신청자에 대한 법무부장관의 난민인정결정을 규율하고 있다. 난민협약을 비롯한 국제인권법은 난민에게 입국의 권리(right of entry)는 보장되지 않는다고 보고 있다. 다만, 국내법의 차원에서 난민에게 일정한 권리를 부여하는 것은 국제법과는 별개의 문제이다. 난민법의 규정이 명확하게 규정하고 있는 것이 아니라면, 국제인권법의 이와 같은 대원칙에 비추어 동 규정을 합리적으로 해석하려는 노력이 필요하다. 또한 난민협약의 당사국인 우리나라가 난민으로 인정되는 사람에 대하여 어떠한 조치를 취할 수 있는지, 어떠한 권리를 부여하여야 하는지 그 국제법상 한계와 범위를 분명히 하는 것도 의미가 있을 것이다. 저자는 하나의 구체적 가상 사례를 통하여 출입국항에서 난민인정신청을 한 한 명의 외국인이 어떻게 자신의 권리를 주장할 수 있는지 탐구하는 방식으로 이 글을 전개하고자 한다. 이러한 방식은 위 각 쟁점들의 실천적 의미를 부각하고 쟁점을 보다 명확하게 할 수 있을 것이다. 나아가, 이를 통하여 난민법, 특히 출입국항에서의 난민인정신청 절차의 문제점 및 개선방향을 지적하고자 한다. The Korea`s Refugee Act enacted and proclaimed as Law No. 11298 on February 10, 2012 and having been effective from July 1 in 2013 is evaluated that it advanced a step further in the enhancement of rights of refugees in that it introduced refugee application at entry and departure ports, enforced regulations on procedural rights of refugee applicants, and secured grounds for establishment and operation of refugee support facilities. The Refugee Act explicitly specifies refugee recognition application at entry and departure ports at Article 6 and the same article and enforcement regulations have made lots of controversies. It is not clear if the rejected applicant who made refugee recognition application at an entry and departure port by Minister of Justice could file administrative litigations, and in this case if the applicant should fight against non-filing decision or entry rejection decision. Additionally, the same regulations do not specify where the applicant can stay during the proceedings and if he has procedural rights such as assistance by a lawyer. First of all, these discourses should be reviewed from the perspective of international human right acts such as refugee agreement and refugee protocol that Korea has signed. On the other hand, Article 18 of the Refugee Act regulates refugee recognition decision by Minister of Justice on the qualified refugee recognition applicants using different expressions from old Immigration Control Law. International human rights acts including refugee agreement do not guarantee right of entry to refugees. To grant rights to refugees in domestic laws is one thing and international law is another. If the Refugee Act does not specify regulations clearly, efforts to interpret the same regulations in the light of the large principle of international human right acts should be made. 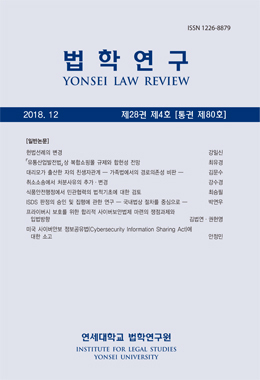 It is also meaningful to clarify the scope and limitations according to international laws such as what Korea can do for qualified refugees as a member country of the refugee agreement and what rights recognized refugees should be entitled to. The author wants to develop this article by reviewing an imaginary case. It reviews a foreigner who applied for refugee recognition application at entry and departure port. This case study will clarify and highlight the practical meaning of aforementioned issues. Furthermore, it is tried to point problems and improvements of the Refugee Act, in particular procedures of refugee recognition application at entry and departure ports.